Unable to focus on the recitation of the manthra,Subbarao slowly opened his eyes and started staring at the eyes of the holy deity of Goddess Gnana Saraswathi Devi in front of him in Basara temple that day.. He was staring.. And staring..And staring..And staring..
And suddenly Subbarao started freezing with shock; freezing with fear and freezing with chillness in his spine,while staring at the eyes of Goddess Gnana Saraswathi Devi.. He first saw a little movement..He thought it was an illusion..He then stared again..Then the movement in the eyes of the Goddess was clearly visible to him..He Stared again..And again..And again..And again.. And again..
Finally,the movement in the eyes of the Goddess was much clearer to Subbarao than what it was before.. “Oh my God..It’s no illusion and I have certainly seen some movement in the eyes of the Goddess Saraswathi Devi..”..He told himself..Endorsing his thought there was a furthermore movement in the eyes of the holy Goddess..
Subbarao started freezing with fear and with chillness in his spine not because of that further movement in the eyes of the Goddess but because of the emergence of a tear drop in Her eyes..Those tears that first emerged in the Goddess’s eyes in the form of a single drop later started gradually increasing in size and flow..
A fully frozen Subbarao just remained unmoved with numbness all over his mind,body and soul..He was also not able to think,not able to analyze and not able to comprehend anything that’s happening around him..He just remained static staring at the holy deity of the Mother Goddess Gnana Saraswathi Devi,for a few silent seconds. With tear filled eyes Subbarao then silently requested the holy Goddess..
As though pleased with Subbarao’s humble request,the tear drops that were there for a few moments in the Goddess Gnana Saraswathi Devi’s eyes disappeared in a moment and in a flash an everlasting smile resurfaced on Her mercy filled glorious face..
Then looked around..He found a devotee in every inch of space around him..He then looked at his wife.. She was busy in watching the proceedings in the Garbha Griha of the Temple..He then closed his eyes for a few moments and offered his prayers to Goddess Saraswathi Devi..
Later,he slowly got up from the place,he was thus far sitting in the Temple premises,and returned to his room,along with his wife,after satiating their hunger with the “Prasad’ offered in the temple.. The noble couple were still in no mood to go to their cottages’ canteen for dinner just because of the ill mannered way the kitchen staff of that canteen treated them in the morning..They were also equally upset with the unhappy moments that followed that incident in the canteen..
That ugly incident in the canteen and that unpleasant conversation both of them had in the room in the morning was still haunting them very badly which was why there was still some sort of of uneasy and embarrassing silence between two of them,that evening.. Silently walking all the way from Temple to the cottages,both Subbarao and Venkata Lakshmi slowly reached their room in about ten minutes of time .. But at that silent moment,neither the mystic Brahmin Subbarao nor his beloved wife Venkata Lakshmi was aware that in exactly an hour’s time they both are actually going to be extremely happy and would be thanking the kitchen staff for all the unpleasant experiences they had given them in the morning that day..Period. Subbarao relaxed for a few minutes as Venkata Lakshmi went to their neighbor’s room to spend her post dinner leisure time with them..After about thirty minutes,Subbarao got up from the bed and squatted on the floor to commence the meditation of the Gayathri Manthra from where he had left in the morning ..
As he normally does every time,while sitting for meditation,that time too Subbarao sat close to the west side wall of the room..Then facing the eastward direction,he commenced the recitation of the Gayathri Manthra..
Gradually picking up speed,Subbarao had almost gone into a deep transcendental state when a sudden violent thought disturbed his mind.. Such irrelevant and endless thoughts and a few more similar to them have started tormenting the noble Subbarao’s otherwise peaceful mind disturbing the entire rhythm of his recitation of the divine Gayathri manthra..Ignoring everything,he still tried to concentrate on the recitation..But he couldn’t..
As it happens in every human being’s mind “all the suppressed thoughts in his mind started tormenting him with double intensity..”..Unable to bear with that intrinsic intra psychic stress,Subbarao paused his recitation and slowly opened his eyes..There was darkness all around him caused by the restrictions on the power consumption in the temple town of Basara,those days.. Looking into all the corners of that dark room,Subbarao sat unfazed and unmoved for some time until he suddenly noticed an unusual white colored light emerging from the north eastern wall of the room..With a feeling of the hair all over his body rising,Subbarao kept looking at that light without even battling his eyelids.. 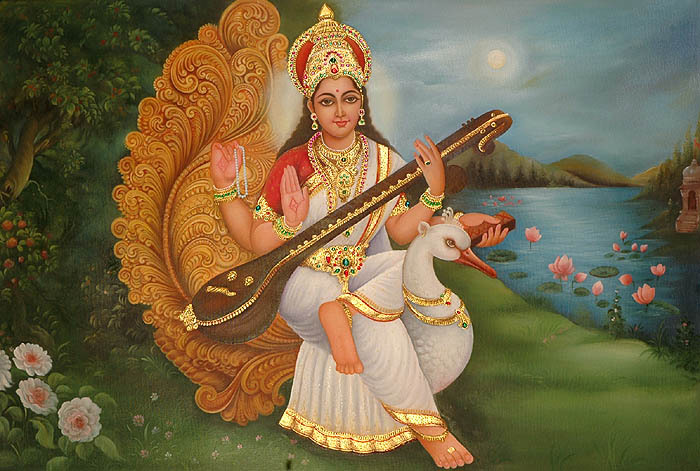 The glittering Goddess Gnana Saraswathi Devi appeared before him..Quickly prostrating himself before Her holy feet,a shocked Subbarao loudly recited the powerful Sloka that pleases Her the most..
With his eyes full of confusion Subbarao nodded his head indicating that he doesn’t..Smiling at his confusion,the Goddess said,”..You said..
“By the way Subbarao,who are those kitchen staff not to offer you food..This is my place and I shall offer you everything you need here..Even otherwise do you think they are capable of doing anything against me or my will..”asked the holy Goddess Saraswathi Devi.. Carefully listening to every word of the Goddess,Subbarao kept staring at her glowing face..
(According to the Telugu language diary sent by Sri Subbarao,the holy Goddess who appeared before him,in the form of a pretty woman that evening,was about thirty years of age and was wearing a rich Pink colored silk saree and a Red colored blouse with a dazzling Golden yellow glow in Her face.. Surprisingly he could clearly remember seeing the holy deity of Saraswathi Devi in the Garbha Griha of the Basara temple wearing the same colored saree and blouse that evening)..
Saying so the glorious Mother Goddess Gnana Saraswathi Devi disappeared from Subbarao’s field of vision..Again there was darkness all around..Subbarao sat in that dazed state for a few more minutes..He couldn’t believe what he had just experienced.. He thought,..”Is it real..Did Goddess Saraswathi Devi really appeared before me and spoke to me or is it only my illusion..? ?..”..With closed eyes Subbarao remained thinking in that uncertain fashion for a few more minutes..
Later he suddenly opened his eyes as he again felt a sudden glow in the field of his vision..He quickly opened his eyes and realized that the glow around him was from the bulb in his room which was again sparkling with the restoration of power supply to the cottages.. But Subbarao still sat in a state of shock looking at something he suddenly found on the north eastern corner of the wall where Goddess Gayathri appeared before him just a few minutes ago..There was something written on that wall..
Something that was emphatically endorsing the presence of Goddess Gnana Saraswathi before him.. Looking at those letters,Subbarao suddenly realized that it is in the same north eastern corner direction that the Basara Saeaswathi Devi temple is located..Bearing that in mind he kept staring at those lovely glittering letters appearing before him on the wall..